Sign up for our newsletter and be the first to hear about new collabs, projects and products! Tuesday night was a real "life event" for me. I had the honor of helping toast THE Gloria Steinem at her 85th birthday party at my friend Brooke Neidich's house. Surrounded by feminists of all kinds, underneath the glow of the Greenwich Village skyline, and basking in the beautiful sounds of Ezinma's violin (she wrote all the string arrangements for Kendrick Lamar's Black Panther: The Album, nbd), we sang 'Happy Birthday' to this legendary leader. And, I woke up the next day wondering if it had all been a dream. The most striking thing about the whole night was the total absence of that sometimes unnerving "you're in the midst of a striking celebrity" feeling that usually hangs in the air in the presence of such "larger than life" personas. Gloria herself was 100% engaged and interested in everyone around her - more so than she was interested in talking about her own life. After a very brief speech spent thanking people (her foundation's leaders, the hosts, etc), she insisted the ENTIRE room of women go around and introduce themselves to the group - to serve as a starting place for connecting with one another. And so we did. 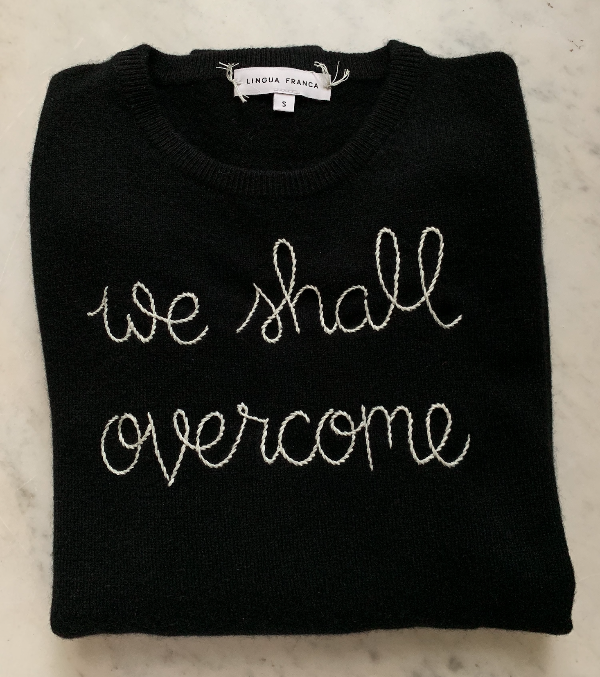 In honor of Gloria, we stitched these "we shall overcome" sweaters in her most often worn color, black! It's a throw back to this iconic photo of course. $100 from each sweater purchased will go to Gloria's organization: Ms. Foundation for Women. © 2019 Lingua Franca NYC.